Indomitable | The online home of Chauncey DeVega: Slave Cabin Sleepovers: Honoring The African Holocaust and Our Ancestors or Trivializing their Memory? Slave Cabin Sleepovers: Honoring The African Holocaust and Our Ancestors or Trivializing their Memory? Would you sleep in a cabin once occupied by black slaves in the antebellum South? Is this honoring the memory of our many millions gone, or is it trivializing their suffering, freedom struggle, and triumph? Yesterday was the informal beginning of my academic year. In a change of pace from last year, I was asked to participate in a program where first year students are oriented to the university and the "big city." My course: Race, Conflict, and Segregation. Yes, I am difficult. And yes, there is no better way of introducing young minds to college than some real talk about power, privilege, and the built environment. Today we went to the local African American Museum of Culture and History. While black cultural politics and history is my broad area of "expertise," I have always found it hard to teach on this topic. As is common with folks asked to work in their depth, we are often more interested in complicating the narrative, while our students are still trying to get the broad strokes and basics. My solution today was to let my young charges wander about and to occasionally intervene when appropriate. However, I did stake out some space for observation. I wanted to see how (and if) the cone of uncomfortable silence and discomfort would magically descend around the exhibit on The Middle Passage and The Transatlantic Slave Trade. Inevitably it appeared. Some White students looked at the manacles and chains curiously...like something alien that they could not comprehend (or was that unprocessed guilt in action?). Few of the Black students ventured close to this exhibit--perhaps for fear of feeling "marked" or "marginalized?" Of being reminded of their origins in The New World and the echoes of history in the present as they yearn for a post-racial future? I wanted to intervene and talk about the millions killed. How America's rise to preeminent economic power was built on the African Holocaust and its human assets. Or to ask them about the diagram of the slaver, where black humanity was chained foot to foot, hand to hand, bodies smashed and abused, soiled and left for dead, whole human cargoes cast overboard for insurance money, trapped for months in the cacophonous cargo hold of a ship where Africans of many peoples entered and a new people--and modernity--emerged on the other side of the Atlantic. I wanted to explain how there was so much death that sharks learned to follow the slave trading routes to catch a quick meal at the cost of little effort expended. And how this crime against humanity still structures American history and our search for a more inclusive and perfect democracy. I chose not to. Was this is a teachable moment never to be recaptured? What would you have said? How would the students have responded? What could I have said to do justice to the honored ancestors and their experience with the incomprehensible? 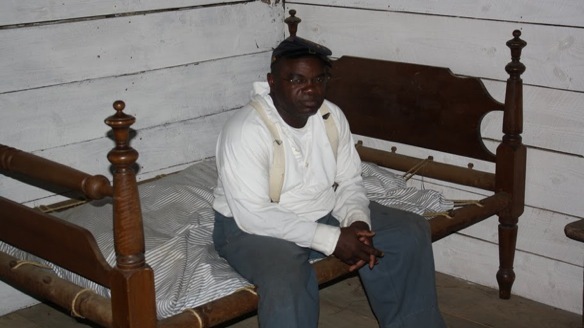 Civil War reenactor Joseph McGill has been trying to commune with the ancestors by sleeping in slave cabins throughout South Carolina. His mission is noble and ought to be admired. However, part of me is uncertain about his project. For example, I have always wanted to go on a tour of the underground railroad where one traces the actual routes used, sleeping in basements, navigating north to freedom over several weeks. I have also wanted to go to Goree Island in Senegal, where I would meditate in the slave fortresses where thousands upon thousands were imprisoned and died. As powerful as the experience would be, I wouldn't have slave dogs on my heels and bounty hunters a step behind me. I wouldn't be trapped in the belly of a beast, exhausted and frightened beyond all belief, for I knew not what would happen to me tomorrow. What would you do? How does one balance a yearning to experience just a tiny bit of the unimaginable with a fear of reducing hallowed ground to a tourism destination? Written by Joseph McGill, Jr.
Joe McGill at Hobcaw Barony. My first slave cabin stay in Georgetown County, South Carolina was Hobcaw Barony. I had great anticipation for this stay because of the county’s historical ties to the growing of rice. Many slaves were imported into the state of South Carolina because of their knowledge of growing rice. Two media representatives made arrangements to spend the night with me on this visit. In the end only one – Eric Frasier from the Charlotte Observer - stayed. His role on this occasion was as a freelance writer exploring my desire to sleep in slave cabins. I met George Chastain, executive director of Hobcaw Barony, at the Visitor’s Center at 6:00 p.m. as scheduled. Representatives from the media were there also. After learning about the history of the plantation from George we all proceeded to the cabins. Once at the cabins the media proceeded to follow my every move as I toured each and every building. The mosquitoes were fierce so I knew that I would be in for a long night. After dousing myself with insect repellent, I became more tolerant of the mosquitoes. When I inspected the cabin, I discovered something unique that the other four cabins that I had stayed in to date did not have – this cabin had most of its original historic fabric left. Hobcaw Barony’s policy has been to maintain, not restore. It suddenly reminded me of my many visits to Drayton Hall in Charleston, SC. The cabin was one of several buildings in the village, which also contained a church, doctor’s office and several other houses. These buildings – which had been lived in up until the 1950s – were an indication of how the plantation evolved from slavery to freedom. Eric Frasier mentioned that getting to sleep would be a challenge for him, but once we got settled into the cabin we discovered a calm that would allow us to sleep. The mosquitoes did not bother us, maybe because of the insect repellent or the burning of the candles or both. Our biggest challenge was the humidity. That was the first time that I slept in a cabin with both doors left open. The next morning I proceeded to do my usual documenting through an audio visual recording. Eric did the same before we both packed up and went our separate ways. In my conversation with George Chastain the previous evening, I mentioned to him that I was trying to make contact with the owner of Mansfield Plantation, which is also located in Georgetown County. He mentioned that Mansfield had an absentee owner but he would do all within his powers to help make that connection. He also mentioned that Mansfield is located on the Black River a fact that I had not previously known. The Black River runs through my hometown of Kingstree, SC. Because of that revelation, this project has now gotten personal. 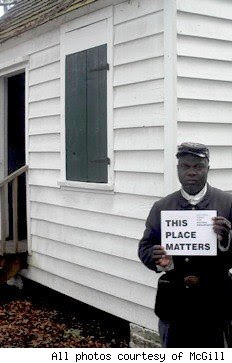 Joseph McGill, Jr. is a program officer at the Southern Office of the National Trust for Historic Preservation. Well, if no one cared to touch this subject... I will. "Was this is a teachable moment never to be recaptured?" ABSOLUTELY! Well, I don't know if it will never return but I believe you missed a great oppurtunity. My question for you: What is/was your fear? If you are the instructor, you have to move your feelings out of the way. I believe Americans are too soft/protective of the true images and feeling associated with slavery. "where black humanity was chained foot to foot, hand to hand, bodies smashed and abused, soiled and left for dead, whole human cargoes cast overboard for insurance money, trapped for months in the cacophonous cargo hold"
Now that's real. If I could only capture you writing qualities. I mean, I just did a post on this same subject, and if I had your hand, I throw mine away. Maybe I'd have told them: remember, sometimes a presentation of information is intended to mislead you; any presentation is incomplete; sometimes the most important information is left out. You must learn to look beyond what is presented and discover the reality for yourself. I usually have strong opinions about the reality involved, but I've learned to keep them to myself. @Carey--What complements! You are doing your own thing, don't ever step back from that. This week is followed up by a traditional course of ten weeks. I let things marinate. I want to watch then intervene. My internal general I guess. I also believe that students want to be held, talked to, coddled at times, and someone to give immediate answers. I do the opposite. I want thoughts and feelings to sit and then become comfortable. At that time I can then turn over the apple cart. @Fred--What are you keeping to yourself? Pray tell! Oh, Professor, I choose not to go there. When I was younger, I was very free with my opinions, and little good came of it. Maybe I was right sometimes, maybe often, but I only alienated bosses, teachers, friends, and a wife. So I prefer to smile through, and massage difficult issues like a Swedish woman with oily hands, rather than poke around disturbingly like a Thai masseuse, who leaves you for two days feeling like you've been in a car accident. But I admire your courage and talent, and I thank you for carrying the flag for we, the reticent. But Fred, you can't leave us hanging, and I've already received rewards from you stopping by. I love to sit around wordsmith and watch them do their thang. You and the professor (gotta give him a nickname) have a way with words. But I do understand. I've heard it said that fools go where wise men tread not. But from my perspective, it's never to late to learn. See, I'm a old fool but my eyes and ears are still open. I am a black cat that has lost eight of his lives, so I am still hanging on, and still looking for one more big bang. In reading your article, I had a question pop up for precisely a professor in the area, and curiously, CareyCarey's link underscores it. When and where did the term "Holocaust" become attached to what happened to Africans in the American slave trade? I've always thought the Jewish "Shoah" was called 'the Holocaust' in English in part because it means 'to burn in the entirety.' There seems to be an element of trying to say 'our tragedy is bigger than yours' by adopting this term to what was done to the millions of Africans. I'm not Jewish, but have curly hair, and have had more than one black American visibly lose hostility upon finding that I'm not Jewish. Can you help me to maybe understand some undercurrents I may be missing? Hello Anon (why do people post under that name *smile*?) Nevertheless, I am pleased you took the time to read that post. Although I am not a professor, I could answer (or attempt to) the first part of you question but I'll wait for the professor. However, I'd like to take a stab @... "I'm not Jewish, but have curly hair, and have had more than one black American visibly lose hostility upon finding that I'm not Jewish"
If I am reading you correctly, you are saying some blacks drop their guards/defences, upon finding out that you're not jewish? Well, I don't know what you mean by "visual hostility", but if you are talking about a position or stance that gives you the impression they are leery of you, I think I have a little insight into that dilemma. First, it's no secret that many blacks have been bambozzled by non-POCs. Consequently, their guard/our guard is generally in a cocked position (consciously, and unconciously). Then, considering the history of Jewish landlords and shop owners in the communities where blacks were forced to live(which in the eyes of many were not favorable), there's still an undercurrent of hostility and/or concern. "When and where did the term "Holocaust" become attached to what happened to Africans in the American slave trade? That has been a move for some time beginning in the 1970s (I believe) first with afrocentric scholars, then expanding outwards to other communities of scholars. I prefer the term to the generic "Atlantic Slave Trade" because it highlights the murderous and near-genocidal aspect of the slave trade. Most people--black, white, and other other--don't know that millions, likely tens of millions of people were killed in the centuries long slave trade. Here is the corrective/question--do Jewish folks have a monopoly on the word "Holocaust?" Native Americans suffered a holocaust. Armenians did at the hands of the Turks. etc. etc. There is a whole politics of language here about the use (and abuse) of the word Holocaust that can become really inflamed at times. Nice volley Chauncey, but I understand Anon's question. I think he was directing his question at the word "holocaust". In this case, I beleive you and he have valid points. On one side, a holocaust can mean, and does mean a complete destruction. In his use of the definition of "holocaust"(I've always thought the Jewish "Shoah" was called 'the Holocaust' in English in part because it means 'to burn in the entirety. '), I believe he was referring to a destruction by fire. But yeah, the American Indian has to be thrown in the mix. Now we're talking about another devastating destruction. Yep, who owns the word?